Olive oil is often touted for its health benefits, particularly virgin and extra virgin olive oil. This is due to its monounsaturated fat content, which is connected to heart health and weight control. Olive oil is also versatile, as it can be used to saute vegetables or bake meats, and it can even take the place of butter in cakes and other desserts. 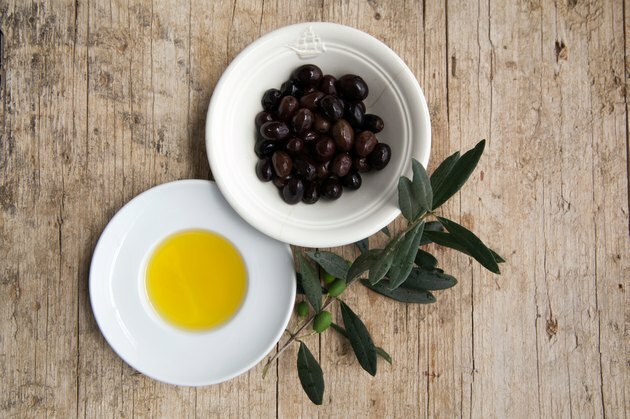 The region where your olive oil comes from may have an effect on the flavor of the foods you eat, though, so it is important to know some of the differences between the most common olive oils: Spanish and Italian. One difference between Spanish olive oil and Italian olive oil is color. Spanish olive oil typically has a golden yellow color, while Italian oil tends to be darker green. This has to do with the climate in Italy being more temperate year-round as compared to Spain. The thickness of the olive oil does not tend to differ, though. Another difference between Spanish and Italian olive oils is their flavor. Spanish oil often has a fruity, nutty flavor. Italian oil, on the other hand, has more of a grassy flavor with an herbal aroma. Spain produces about 45 percent of the world's olive supply, while Italy offers about 20 percent. You may not be able to tell much of a taste difference between the oils, though, as they are sometimes mixed together or added to oils from other countries. Studies note that Italian virgin olive oil has higher levels of cycloartenol than Spanish virgin olive oil, according to the book "Olive Oil: Chemistry and Technology" by Dimitrios Boskou. Cycloartenol is a sterol that lowers the amount of cholesterol moving through the body and also increases the excretion of bile, lowering acidity in the body. Interestingly enough, Boskou adds that these same studies found cycloartenol to also be higher in Italian virgin olive oil than Italian solvent-extracted oils, which once again shows that the type of olive oil you purchase is just as important as where it comes from. One of the reasons you may not notice much of a difference between Spanish and Italian olive oils is because they are mixed into the same bottle. Despite the fact that many olive oils say "Product of Italy," they are actually a combination of several countries' oils, including Italy, Spain and Greece -- they were just packaged in Italy. This is partially due to the fact that Italy does not have enough olive trees to support supplying international demand for the oil. Chef and writer David Lebovitz recommends not worrying about the country of origin of olive oil and instead focusing on the taste and quality of the product.